At Thanksgiving, showing gratitude is top of mind, but it’s important that you show gratitude at work all year long. If your employees or coworkers are made to feel appreciated on a regular basis, it will be a step toward creating a work atmosphere of loyalty and engagement. Gratitude should be the center of your work, no matter what you rank in the company. Don’t wait until you are a leader in your company to show gratitude to other employees: start as soon as you are part of a company. If you wait until you are higher up in the company to begin showing gratitude, people might not think it is as genuine, and you won’t have a strong foundation for your relationships. Tell those around you that you’re grateful for their help regularly, and you might move up even quicker as you grow your appreciation network. Statistics show that recognition drives productivity. Sixty-nine percent of employees state that they would work harder if they felt more appreciated at their job. This confirms that showing gratitude improves production! It’s possible that this way of thinking goes all the way back to getting gold stars in grade school for a job well done. Make it a point to show employees gratitude more frequently and watch your production numbers skyrocket. Expressing gratitude often can take people by surprise at first. It can be rare, in today’s society, for people to thank their coworkers and really mean it, so when you do so, make sure you are sincere and honest. A handwritten note is especially rare and can leave a lasting impact. Genuine praise goes a long way! This one is true especially if you are in a leadership role. As a leader, your success depends on your team. Acknowledge those on your team who work hard and help you achieve your goals. Don’t let those day-to-day achievements go unnoticed. If you aren’t a leader, it’s still important to be humble. 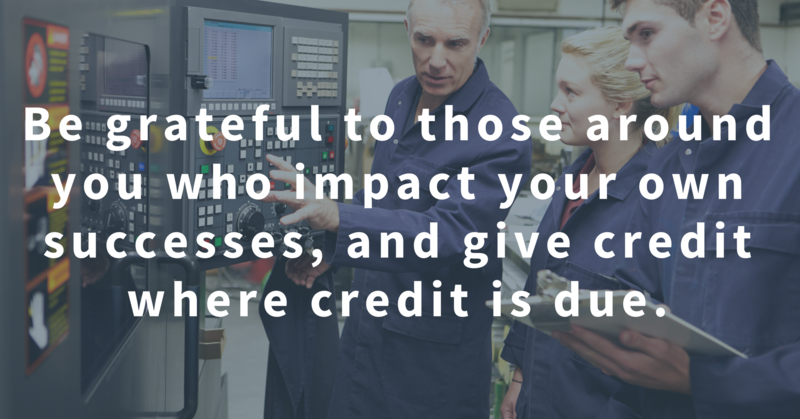 Be grateful to those around you who impact your own successes, and give credit where credit is due. Remember to be grateful to your coworkers and employees, this Thanksgiving and beyond! You will be repaid in employee loyalty, respect and company success!